Victorious Slots - Review & learn how to win NOW! Step 1 – Choose your ideal coin value, from 0.01 to 0.50. Step 2 – Select your level, from level 1 to level 10. This determines how many coins you'll play with Victorious slots. Step 3 – Hit the spin button and start playing Victorious now! This is one slots game you can really be Victorious in! This Roman themed game packs in no fewer than 243 chances to bag a win. The golden laurel provides free spins if you get three or more of them. The golden bird acts as a wild to stand in for all other symbols, maximizing the chances of a winning line. You should watch for gladiators, soldiers and classic scenes from Roman times as you play and hope to become Victorious. As you'll see, Victorious slots unlock plenty of winning chances with every spin you play. The higher the levels you bet on, the better your chances are of winning a huge cash prize. 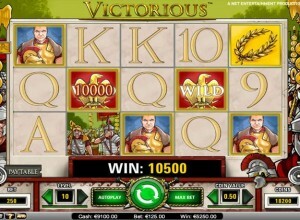 Try Victorious in free game mode to get the hang of it and then transfer to playing Victorious for real money. Take on the challenge posed by the characters in ancient Rome now for winning results.